Some stocks have cycles. In a down cycle they do badly. In an upcycle, they do so well that you watch in awe as profits go through the roof. But a cycle involves a return to innocence. What goes up, then goes down. But somewhere in the cycle, balance sheets get stronger, stocks get smarter and portfolio returns go to insane levels. Here’s one story. Two stocks have been doing the rounds: HEG and Graphite India. We have covered them in separate “Outlier in Focus” posts. (On Graphite at a price of 153 in June 2017 and HEG at 689 in September 2017) We even have Graphite in our EV Portfolio. Less than 6 months later, Graphite is at 550, nearly 4x the price in June. And HEG is at 1900, a 3x return from September! Note: the stocks have been hammered with a 5% lower circuit on both yesterday, but this post is not to recommend them. It’s to understand their rise. What’s with these stocks that seems to keep getting investor interest? The answer comes from a strange place. ​​​​​​​Chinese Pollution Control. China’s had some serious problems with air quality. There, smog got so bad in 2016 that schools had to be shut for five days. People were told not to step out. And that kind of stuff lights a fire under some seriously powerful posteriors, as we seem to have found out. The government moved into action. They started telling the polluting factories to shut down completely if they were polluting too much. And some industries will benefit because whatever’s being shut down is supplied from somewhere else. 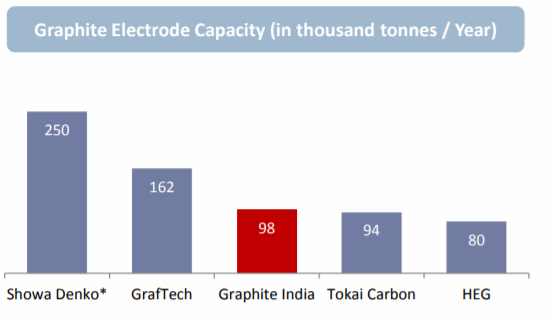 Along with a truckload of Indian Chemical Companies, two big players in the Graphite Electrode Industry – HEG and Graphite – got sudden and massive attention. But we must digress now. To a quick understanding of steel. Why’s it important? We don’t really know but it helps set up context. You take iron ore. It’s largely iron oxides. You have remove the “oxides” part. So you heat the bejeezus out of it to remove the oxygen. This is done in a blast furnace, with iron ore, coke (a form of coal that’s heated in a no-oxygen environment), and limestone (which removes the impurities in the process). A blast furnace is made of steel, lined with refractory brick (which doesn’t disintegrate with high heat). You put in the elements from the top, and blow hot air from the bottom to ignite the coke. The heat produced is so high that the oxides burn out to separate, and what’s left is molten iron. The limestone gathers impurities and becomes “slag” – which floats on top on the molten iron and is removed periodically. Slag is used to make cement, so cement factories located close to steel plants have a big benefit. 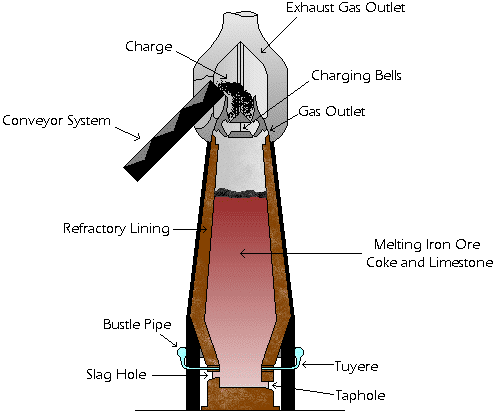 If you put molten iron, older steel (“scrap”) into a big furnace and direct a strong steam of oxygen towards it, the oxygen removes the carbon, silicon, sulphur and phosphorus that is in molten iron – and it becomes steel. This is how around 74% of the world’s steel comes through. In a Basic Oxygen Furnace. And what does this have to do with graphite electrodes? Bear with us. This whole furnace thing is a hugely polluting thing. You burn coke, and it delivers smoke and gases and all sorts of things that ruin the atmosphere. Remember all that Chinese pollution problems we mentioned earlier? Well, the Chinese went around shutting down blast furnaces because, well, pollution. China’s been the world’s largest steelmaker (it makes more than the next 10 countries combined). So when China shutters production, things change for the world. But now the important part. There’s another way to make Steel. Take scrap steel. You know, cars, and old bars and all that. Put them in a massive container. Lower a lid which has electrodes in it. When a high current is passed through the electrodes, the heat generated – a whopping 2000 to 3000 degrees C – will melt the scrap steel. An electric arc forms through the electrodes and the steel and melts it. The temperatures are so high that only Graphite as a commercially available material can withstand it while still conducting electricity. This is much less toxic for the environment. You use electricity instead of burning through coke for the steel making process, and you reprocess used scrap steel. So good, no? Note: Watch this video for how steel is made in a blast furnace. 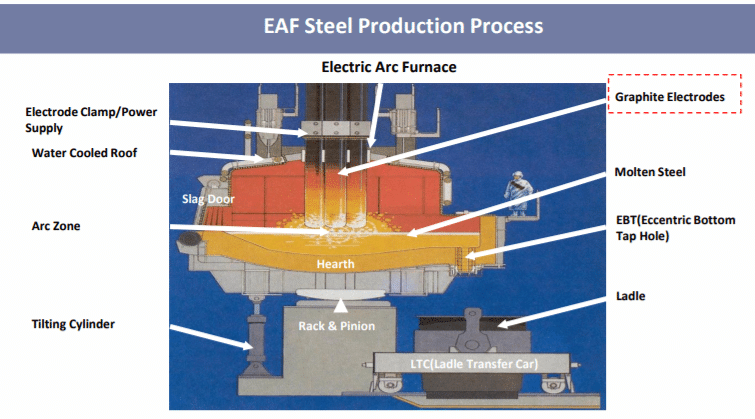 And how an electric arc furnace works. The Chinese started to move to it, because of the focus on lower pollution. More EAF plants have been coming along. And then, with the lower Chinese steel production, even mothballed plants in other countries – mostly EAF based – were restarting again. The demand for electrodes increased after 2017 and is continuing to increase now. China used to manufacture a lot of electrodes too. But even that – it is also a polluting activity – has been reduced due to the new anti-pollution drive, where factories have been asked to shut or move away from cities. According to Platts, 30% of China’s electrode capacity has been shut. The price of electrodes has increased over 3x – from $2,000 a ton, to $6,000 a ton on average, with spot prices exceeding even $25,000 a ton in some circumstances. No wonder then that companies like HEG and Graphite are making ridiculously high margins. Graphite grew earnings by 464% in Q2 to Rs. 90 cr. , while HEG had a profit of 113 cr. in the quarter (it made losses last year). And these are among to top producers in the world. The problem: Not enough capacity? And Rising Input Costs. Graphite electrodes have concentrated carbon. And thus, need a pure source of carbon, which is in the form of needle coke. Needle coke is a purer form of pet-coke, and is mostly imported, again from China, or from a few producers around the world. It forms about 44% of the cost of making a graphite electrode. Needle coke prices to are up 10x to 20x in the year. Some of it is the rising demand from electrode makers, but also because needle code is great for the manufacturing of Li-Ion batteries, where demand has also increased. A rise in needle coke prices can be big enough to crimp margins. And then, capacity isn’t exactly increasing. Apparently the last time a big company got into electrode making was 1977. The current players are just getting bigger. However, Graphite and HEG are running at around 80% to 90% capacity utilization, and so have only a small increase in utilization possible. A steel plant runs through a 2 ton graphite electrode in 10 hours. And per ton of steel, you need 2 kg of electrode; a million tons of steel will need about 2000 tons of electrodes. Current world capacities – around 730,000 tons of Graphite Electrodes – can satisfy about 400 million tons of EAF produced steel, around 26% of current world production. This is the world electrode capacity right now. At 100% utilization. If more EAF mills come online, capacities need to increase – but they will take one or two years, apparently, to build in new electrode plants. Only 2% of the cost of steel will be electrode costs. Most of the contracts are made in advance, typically annual contracts. So much of the capacity in Graphite and HEG would have been absorbed by pre-set contracts – so they have to deliver at the preset rate, regardless of current prices. But the contracts are being renegotiated now. Contracts are moving to quarterly or six-monthly ranges, and some producers are putting in clauses for increases if needle coke prices rise. New contracts mean that in the next year, capacity utilization at 80%+ will still mean a massive increase in revenues, and if needle coke pricing remains stable, equal or higher margins. The companies are quite confident that the situation will last another two years. Even upstream companies are seeing the benefit, like Rain Industries and Goa Carbon who manufacture Calcined Pet-Coke, a raw material for (some) electrodes. But How Much Can Profits Grow? HEG has a capacity of 80,000 tons. Assuming 90% utilization – 72,000 tons – and a price of $6,000 per tonne, and a price of Rs. 65 to a dollar, Rs. 2800 cr. in revenue. They’ve made a ludicrous 30% profit after tax on it. But let’s assume a more reasonable 20% and we should see a profit of Rs. 560 cr. For about 4 cr. shares, that’s a profit of Rs. 140 per share. At the current price of Rs. 2000, we have a P/E of about 15. But what it really does is to remove all of the debt, effectively: They have 650 cr. of borrowings – which can then go to zero (net) borrowing. It also has a huge ROE – a net profit of 500 cr. on an equity base of Rs. 1000 cr. does look good. Graphite India is similar. They actually have net cash of 480 cr. and they have a capacity of 98000 MT. At the same metrics, their revenue goes to 3400 cr. and profits at 20% will be 680 cr. This is an EPS of Rs. 34 per share for FY 19. Graphite’s cash will then move up to Rs. 1000 cr. and they’ll end up with a P/E of around 20. Their ROE will be about 30%. too. Does this mean these are fantastic investments? Hardly. These are extraordinary times for these companies. Capacity will be expanded – the biggies (Graftech etc) have recently shuttered about 200,000 tonnes of capacity and that will take another 1-2 years to rebuild. After that, prices will correct substantially and the $6,000 per tonne won’t happen beyond 2018. If HEG and Graphite use the cash they receive to expand capacity further, they will then be saddled with losses in the eventual down-cycle. What Would Make Them Interesting? We own the stocks in different strategies. In one, we’ve traded in and out of HEG three times (it’s a short term portfolio). But would they make a good long-term bet? A smart move, for them, would be to use this cash to create new business lines instead of expanding current capacity dramatically. They need to diversify away from a pure electrode manufacturer to perhaps one that can service upcoming areas (like EV batteries, or other carbon formats close enough to what they do). Or, they could choose to pay big dividends, or do mega-buybacks, to increase investor returns. We don’t yet know what will happen but one of the above should create room for a better long term return. Or, they expand capacity and at the same time, EAF usage worldwide can increase. If we get 500 million tons of steel via EAF versus the current 400, we have a 20% market increase which translates to more capacity needs and utilization. Also at these prices, the companies seem fully valued if new contracts are at $6,000 per ton. If the contract prices are higher, they add to margin. If the spot prices stay up even higher, we can expect even bigger profits. This is not a recommendation, but a way to look at these stocks for analysis. Electrode manufacturers make heavy profits. And stock prices go through the roof. Stock prices can come down just as fast, if new capacities come online soon. And if the companies spend the cash badly, and ruin future return ratios through overpriced acquisitions or such. A temporary price spike has a massive effect on fixing balance sheets of these businesses. Sometimes, that can change the fortunes of a business. And sometimes, it can make them complacent enough to lose to the eventual downcycle. We don’t know how long the madness will last, but these are the opportunities which make portfolios grow just as fast as the companies themselves. Disclosure: I own Graphite, have traded HEG many times recently. Don’t go around buying these stocks even if you liked this story. Or hated it. You have to do your own research before actually making a trade. Treat this as purely education. There’s more wealth in that than blind following, as I am sure many people will soon find out.